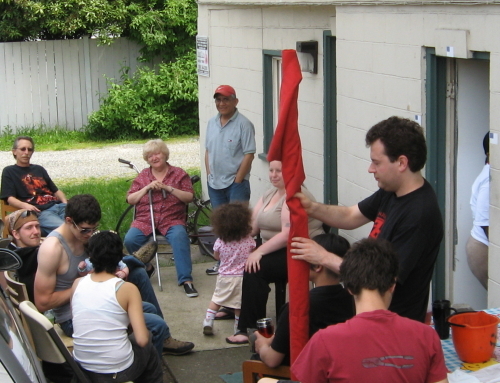 On Friday May 16, tenants at twelve apartments behind the Green Lake Motel on Aurora Ave got a surprise visit from their landlords - who also own the motel and a few others - saying they had two days to move out, or they'd be arrested. The motel's license was being suspended due to unsafe conditions, and the apartments had been operating (possibly wrongly) under the same license. Some residents cleared out right away, and a favored few received temporary lodging in one of the owners' nicer motels. The rest received nothing, except repeated threats that they'd go to jail if they weren't out on Sunday. They had nowhere to go, not much money, and no time to find a new place. They weren't helpless though: some had experience fighting back, and some had already been involved with the Solidarity Network. They immediately started to organize. Sunday morning, while some neighbors were finishing their packing, eight tenants sat down together beside the building and waited. Throughout the day they were joined by friends, relatives, and 16 others from the Solidarity Network. Mid-afternoon, three police cars came with orders from management to arrest any non-resident - apparently including friends and relatives - who wouldn't leave. A crowd gathered around the police, and residents insisted that this was their home, they'd lived there for years - for one woman, 24 years - and that the rest of us were their guests. After a short debate, the police left. Since then, there have been (as of Monday night) no attempts to remove the tenants. They have managed to attract a barrage of media attention, legal aid, and some offers of charitable help with moving expenses. They've decided to stick together and fight this as a group. Their goals now: to seek housing aid, since they're having to move at short notice, and to make the landlords pay.